Click the blue bar again to collapse. Tickets: £10 ‘on the door’. Interval refreshments. Concert: Battle of Britain Charity Concert organised by The Rotary Club of the North Downs. Picnic-style concert with seating at tables - bring your own food/nibbles. Licensed bar. Parking on site. Concert: SEnine Magazine Variety Concert . 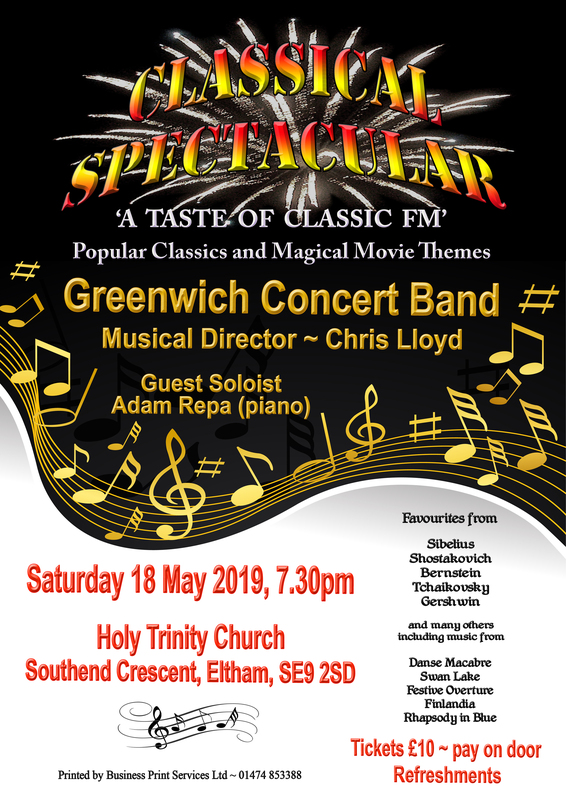 Features music from Greenwich Concert Band plus Greenwich Community Choir, the Celtic Hearts and invited local performers. Tickets: £12 – Advance tickets can be obtained from the Band (Jacky on 07885 764578), from Christ Church (contact number tba) or via daveandjacky29@dsl.pipex.com. Interval refreshments inc. mulled wine and mince pies. Time: Start 5pm Please note early start time. Time: Band Starts 5.45pm - Service commences 6pm. Wine and mince pies after.